Brand: Wichtel For Schildkroet-Puppen Eye type: Green Glass/Fixed Size: 30cm/12" Hair: Red/ Wig Articulation: 5 points This puzzled looking little doll, named Lily is made by Schildkrot in Rauenstein, Germany. 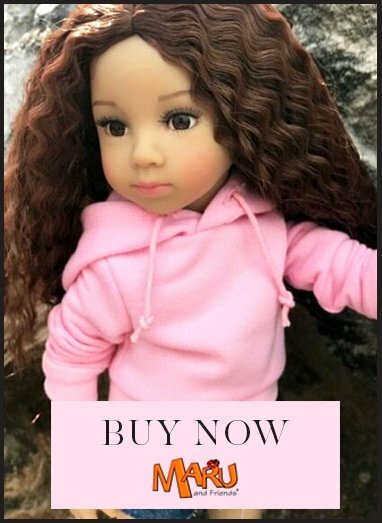 Lily's entire face and body mould is sculpted by German doll artist Rosemarie Muller and Schildkrot has the pleasure of manufacturing to order, dolls from 4 of the Muller-Wichtel moulds, of which there are 24 in total. The dolls are named "Wichtel" dolls which translates to "elves" - 'balm for the soul' is how they are often referred. The vinyl is completely hard phthalate free vinyl. There are 5 fully articulated joints. Girl and boy dolls have different abdomens, like little girls and little boys! The hair is a hand knotted human hair wig. The large open eyes are hand-blown glass eyes from Lauscha (the very best eyes!) and the face is lovingly painted by hand. Lily has tiny eyebrows which work beautifully with her big eyes. Lily's hair is a curly red wig and her eyes are green. Lily's outfit consists of: pink and grey striped t-shirt which fastens at the back with buttons matching pink and grey striped 3/4 trousers white ankle socks pink and white daisy printed tunic with glitter tulle trimming to the bottom. This fastens at the back with buttons pink leather shoes with flower detail daisies in her hair she carries a windmill Heless clothing will fit Wichtel dolls. Maru & Friends and Carpatina shoes will fit Wichtel dolls.